Nocturion is a browser based, resource management medieval strategy game set in a fantasy world. You play a hero of the fallen Empire of Evergreen, sent out into the wild to reclaim the lands and restore peace and order. In order to do that you build Outposts, with the first of them being designated as your Headquarters. You have been given a small loan from the Imperial Treasury and you are now ready to populate your outposts with buildings and units. Buildings provide your outpost with some constant benefit: Farms provide food, the Arcanum produces ground units, the Worksmith contributes to your research. Buildings have a level ranging from 1, the least developed, to 10, the most advanced. Units function as ground or air forces. You can use them for defense or use them to raid players (pvp) or the environment (pve). Some units have special functions, like transporting goods or creating new outposts. During the course of the game you have the option to complete Missions, which give you special rewards. You need time and resources to create buildings and units, so you should establish a steady resource production line. The buildings that produce the basic resources are Farm (produces food), Fountain (water), Quarry (stone) and Lumbermill (lumber). Upgrading a building to a higher level offers higher production per hour, but higher levels need longer times to complete. Consider building more low-level resource-producing buildings at the beginning. You can always destroy redundant buildings to make room for more important ones. Complete at least the first missions, to learn the basics of the game and to give yourself a good start. You will also soon get a mission to get a Caravan and build a second outpost! For a small amount of (real life) money you can buy CP (Character Points) which are used to speed up some aspects of the game. Your current CP amount is displayed at the upper left corner of the screen. You start the game with a small amount of CP for free. You are also awarded bonus free CP on different occasions. Important: CPs do not give access to special or secret content (such as units, buildings, technologies or missions). Imperial Tokens are used in the game to complete advanced tasks, such as upgrade your buildings to high levels, completing critical missions, raise your alliance's talents or increasing bank slots. a) Completing Daily Missions. Depending on your progress in the game you can get up to 5 IT per day via Daily Missions. c) Taking part in the World Events. By reaching the minimum Participation Points in each event you are rewarded with a Participation Badge. You can then cash out bundles of these badges for IT or even CPs! d) Using the Marketplace, you can sell stuff and get ITs. 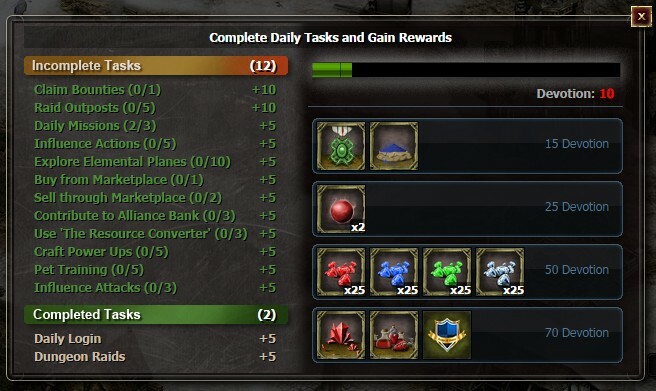 In order to better guide players to the various game elements, a simple daily dialog presents them with tasks to complete to gain useful rewards. This dialog appears in your Headquarters (your first colony). Players gain points by completing the tasks on the left column. Once they reach certain totals, they can obtain the items shown on the right. For example, if players complete enough tasks to obtain 50 points, they can get the first, second and third rewards. Important: The total is reset to zero every day!